Big price reduction... priced to sell! Hidden gem of a place! Property is a great rehab/flip opportunity. Turn this place back into the private dream tropical paradise it once was. The now dry man-made fishing/jet skiing lake (almost 2 acres in size) with island has a fishing dock and bridge in need of being replaced. Utilities to the property need significant repair and are inoperable. New electrical boxes and wiring needed. House needs a new roof and new flooring. This 5-acre lot rests in the aquifer rich valley of Newberry Springs. Property is on well water, but not active due to electrical not being on. Well pumps look to be in good condition. Several neighboring properties have created man-made water skiing lakes and water-front neighborhoods. Nestled between the fork of I-15 and 1-10. 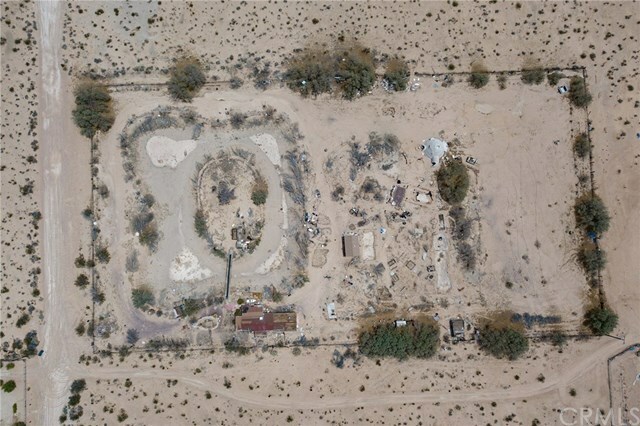 Property hosts a newer shed and a nicely constructed desert adobe structure, both of which need some repairs. Other water features include several agriculture water lines throughout the 5 acres, a koi pond, and a rock waterfall that are currently inoperable.